When the last emperor of the Qing dynasty, Hsuan T'ung was forced to give up his throne in China in 1911, the coinage of the ancient copper cash coins had been ceased in most of the provinces except Yunnan, Szuchuan and Fukien province in China. The Mint masters found that they could not cast the tranditional cash coins economically, they stopped casting and engaged in another kind of circular coin struck by machinery without a square hole in the centre. It was called "T'ung Yuan" [ copper coin], or "T'ung Hsien" [ copper cent] and or "Tung Pan" [ copper plate]Each one is equivalent to ten cash. 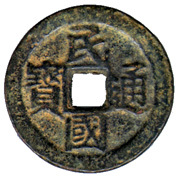 Min Kuo T'ung Pao coins belong to the transitional coinage which were cast between the old style copper coins and the new machinery circular coins. No. 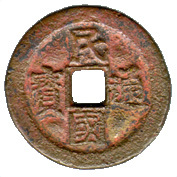 021 These coins are in the name of Republic "Min Kuo T'ung Pao", I think they may be the last "Fang Hung Ch'ien" [ copper cash with a square hole in the center ] cast in China. It is believed that these coins were cast in Chengtu of Sychuan Province. According to other sources, "Min Kuo T'ung Pao" was cast by Tung Ch'uen Mineral Company in Tung Ch'uen of Yunnan Province during the period of 1913AD to 1914AD. 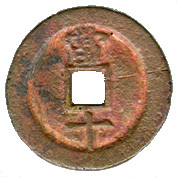 Inscriptions on the reverse are Chinese characters "Tang Shih" means equivalent to ten cash. The Chinese characters "Tang Shih" showing the varieties exist. These coins belong to the transitional coinage which were cast between the old style copper cash and the new machinery circular coins "T'ung Yuan" [ ]. 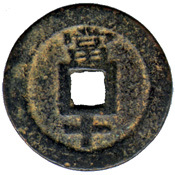 Liu Chu Cheng : (Illustrative plates of Chinese ancient coins) National Bureau Cultural Heritage 1988. Pang Hsin Wei : The Currency History of China, 1988.